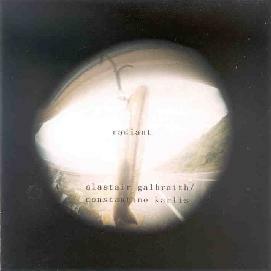 Alastair Galbraith/Constantine Karlis - "Radiant"
First a bit of a caveat - I am a HUGE fan of Alastair Galbraith’s music. He has always been one of the best the New Zealand underground has had, yet never has gotten the level of notoriety that many of his fellow countryman have. His solo releases have been nothing short of stunning, and his has also to push the envelope in collaborations, as he has done in A Handful of Dust, the violin/piano wire collaboration with Matt De Gennaro, or this new one, a violin/percussion workout with Constantine Karlis, drummer for the very fine New Zealand psych group High Dependency Unit. The title track is the centerpiece, a 35-minute workout that brings to mind a loose, jamming take on the early Dirty 3 and the minimalist compositions of Tony Conrad, but at the same time is it’s own thing. Galbraith’s violin ranges all over, from lovely minimalist rumbles to high screechy tones, but the noise is balanced by melody throughout. Karlis, who I have never heard play in this sort of loose improv type situation, does a great job as well. Looped drones (more violin, I’m guessing) anchor it all together. The second track, "4 Orbits" clocks in at a mere 8 minutes, but covers a wide swath of ground, starting off with gentle pulses of feedback and ringing cymbals and building up through frantic bowing and string plucking to a quite noisy conclusion. It’s pretty much impossible to argue with the sheer loveliness these two have created here.